Glorious sunshine proved a great setting. Day two of racing at the Bruce Wake 2015 Hansa Class European Championships were hampered due to a lack of wind in the morning. 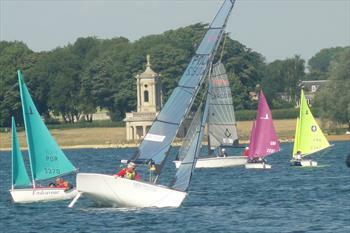 The races, which were due to start at 11am, were brought back to the jetty by Rutland Sailability members after the boats were at a standstill for around 2 hours. Wind picked up at 13:30, which prompted the race team to set up a new course. 303 two persons and the SKUD boats would go out with the intention of getting the first race of the day underway. Glorious sunshine and a higher wind resulted in a fantastic race with the two persons 303 and the Skuds all getting their two races away. 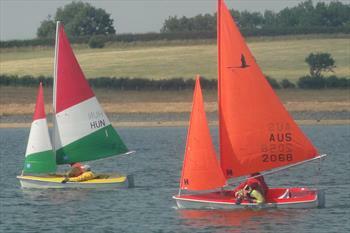 Array of colours set a fantastic scene across Rutland Water. After both of these races finished, went onto their second race straight after. In the two person 303 boats, Portuguese pair, Joao Pinto and Guilherme Ribeiro recorded a 2-2-1 in their three races leaving them top with a total of 5. Pedro Reis and Andr Bento are second in the standings. They are level with Hungarian duo who have Zoltan Pegan at the Helm and Eva Mircsev the crew, both teams currently have 7. It was a fantastic afternoon on the water for the Polish brace of Monika Gibes and Piotr Cichocki who won all three of their races, leaving them clear of Spanish pair by 4 points. After a slow morning, due to the lack of wind, it has been a successful day two of racing, which will hopefully continue tomorrow at 11am.